The Shakespeare Pub is an authentic British Pub that was established in August of 1990 and is both owned and operated by British Ex-Pats. The decor of the establishment couples the old world, English Tudor style on the interior (albeit with large picture windows) with a patio deck wrapping the exterior. All of our menu items are made from scratch in the British comfort food style found in most establishments across the isles. Our authentic Fish and Chips are a favorite amongst the locals & have won numerous awards over the years including Best Fish & Chips in the U.S. 2017. We use only top quality ingredients & all of our fried foods are cooked in trans fat, cholesterol free canola. We also serve standard fare of the western world such as Burgers and Salads. Our Draught & Bottled Beers reflect the most popular brands from Britain, Ireland, mainland Europe and The U.S. and we are one of the select establishments in San Diego to have a beer engine and sell a Cask-Conditioned beer, often referred to as 'real ale', for the enjoyment of our beer connoisseurs! 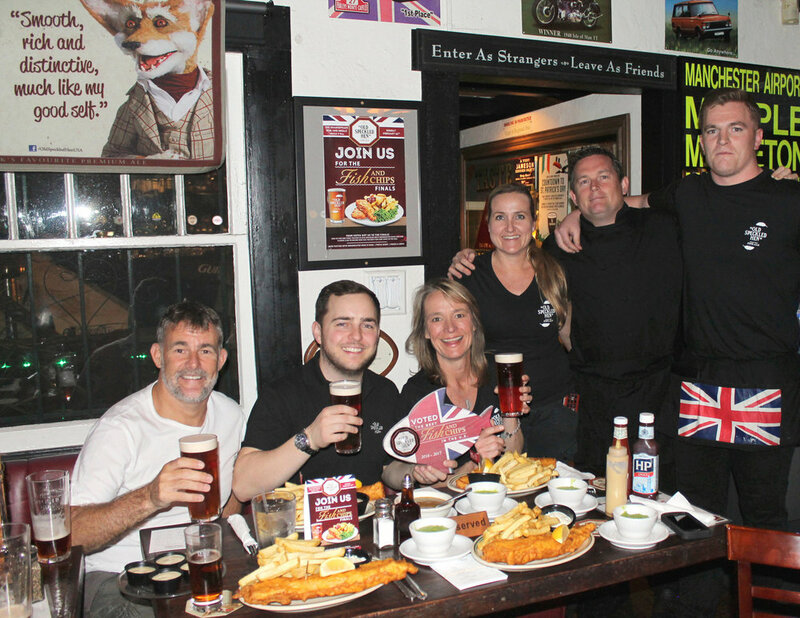 We look forward to welcoming you and showing you why The Shakespeare Pub & Grille is San Diego's Original British Pub! Tender corned beef served on rye bread with swiss cheese, grilled onion, sauerkraut and thousand island dressing. 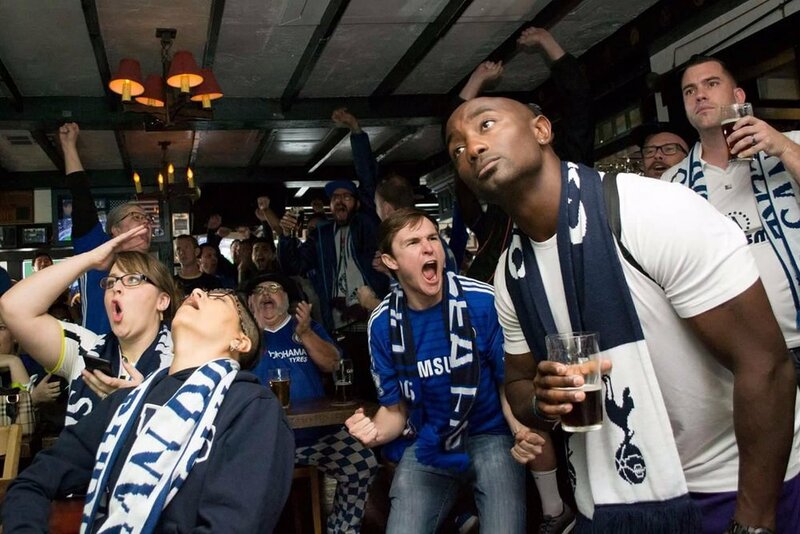 Enjoy games from the Champions League, Barclays Premier League, and The FA Cup, as well as Rugby, NFL, MLB, NBA and more. Although the Shakespeare Pub is best known for its live broadcasts of Football (Soccer) matches, we also proudly support The Padres, Chargers and other sports. For further information and schedules, please view listings of individual matches. All our foods are prepared with top quality cooking ingredients which contain 0 grams of trans fat and are cholesterol free. Menu items are made from scratch by our award winning British chef, Thomas Beatty, who prepares such complexities from Chips & Gravy to Shepherd’s Pie, Pasties, Chicken Pot Pie, Steak and Kidney pie, Ploughman’s Plate, and of course, our famous Fish and Chips. Two Eggs any style with Irish Bacon, English sausage, black & white pudding, Heinz baked beans and all the trimmings. Served every Saturday and Sunday morning. A half pound fresh Angus beef patty served with mushrooms, grilled onions and your choice of either blue, swiss or cheddar cheese. Fresh sliced turkey breast, feta cheese, baby spinach, red onion and tomato. Served in your choice of a flour or wheat tortilla. PLEASE NOTE: We also offer Vegetarian, Vegan and Gluten Free options. Our kitchen is open daily from 10:30AM until 11:00PM Monday through Thursday, Friday from 10.30am until Midnight, Saturday’s we open for breakfast at 8:00AM and close the kitchen at Midnight and Sunday’s we open for breakfast at 8:00AM and close the kitchen at 10:00PM. At the Shakespeare Pub, we believe if it tastes good, we’ve got it. That includes an extensive choice of wines, ports, sherry, ales, lagers, stouts and a selection of classic malt whiskies. For those of you that prefer non-alcoholic drinks, we carry British sodas, juices, non-alcoholic beer, and of course, the great British cup of tea. Greene King Brewery Export Director, Dave Patmore Hill, Head Brewer, Ross O'Hara, Shakespeare Pub General Manager, Ruth Thomas, Assistant General Manager, Nikki McEwan-Beatty, Head chef, Thomas Beatty & Employee of the day, Vinny O'Regan. We are truly honored and excited to announce that The Shakespeare Pub has won Old Speckled Hen’s “Best Fish and Chips in America” award. Having been voted into the finals by YOU, our loyal customers, we were put to the taste test by British Brewmaster, Ross O'Hara and Export Director, Dave Patmore Hill of the Greene King Brewery, the UK's largest pub retailer and brewer… and came out on top! This is not only a huge accolade for a local business, which has been part of the fabric of San Diego for the past twenty-seven years, but also for the city of San Diego itself. On behalf of our proprietor Paul Crawford, our head chef, Thomas Beatty and the Management of The Shakespeare Pub, we would like to thank our fabulous staff, friends, customers and vendors for their tremendous support, not only throughout the competition but also for their dedication over the past twenty-seven years. You can read about our Best Fish and Chips in America award in the San Diego Reader, MissionHillsBID.com and BizJournals.com.